I have been using Creator 2010 to do video capture for movies and download from an older camera using the usb adapter that came with the software. Tis was replaced a few years ago with the same model. I have also purchased the model form vhs to dvd as it was on sale. My issue is I haven't used it in a couple of months and my laptop did a big update and the usb option in the video capture has disappeared. I only show vcd and web cam option. this happened once before, a years ago and I can't remember what we did to fix it. we downloaded a file and I don't know if it was copied from the program disk or from web site. And other than not finding any thing in my download files I'm at a loss. while we are on the subject can I do this using nxt-4? using either hardware? will the program automatically sense the usb video card? can you help? this is probably in wrong forum but forums in 2010 would not let me start a new topic. I running windows 7 64 bit creator 2010 with updates that were available when I bought it. and my laptop did a big update and the usb option in the video capture has disappeared. Well, at least you know the answer to one of your problems.
? There have been a few Video Capture Devices that work on USB. How about looking in your Device Manager Sound, Video and Game Controllers, both Before and After plugging in this device? Do either of these look like your device? If so, which one? I have no idea why the selection disappeared. Just looking at what changed between the last time I used program a few weeks ago and now. things always work different after any kind of update. USB devices: I now have both. I picked up the newer one with pig tail at the usb end to reduce tension on the port. and to see if the original one went bad. device manager lists the devices as "usb composite device" It does not appear Roxio is loading drive but microsft may be????? how would I get proper driver? as to nxt 4 not looking like what I'm used to i'll live with it as long as it works. I had to get used to changes when I upgraded from 5 to 2010 to nxt4. all different and supposedly better and "more functional and smoother"
I just want something that works so I can copy from my dvr to disk with decent definition. Use the newer one only! The older one won't work in Win 7, 8 or 10. Open the Device Manager again with the device plugged in and Uninstall both entries in there. Then remove the device and just to be safe, place it in another room. Reboot the PC and start an install of the EVD Software. Only choose Repair when it is offered. Reboot and go get your device. dc'd device and repaired evd. did put usb option back in creator 2010 thanks. I am not sure that the drivers would even be on the Dell Creator 10 SE... You need the disc with the Easy VHS to DVD. You would need to delete anything in Device Manager - Sound, video and game controllers. Then unplug the device and install the EVD Software. Reboot and it should work. i'll try again. I thought about the evd having the file but it did not want to run. kept telling me there was "a newer version installed." possible conflicts from creator or nxt? very possible I forgot to restart at each step. will keep you posted. not to add more potential problems is nxt6 any better? or alternate program and/or device that would work as well? I cant seem to fix it this time. when it worked it worked pretty seamlessly. how do I do a is it called a setback where I take computer back to see if one was logged at the update? doesn't usually but worth a look. It is called a Restore and don't do that please. Do you have the EVD install disc? With the USB Capture Device installed, remove any references to it from the Device Manager. Then make sure you remove the USB Capture Device and hide it! Don't do any updates either while installing or after reboot. 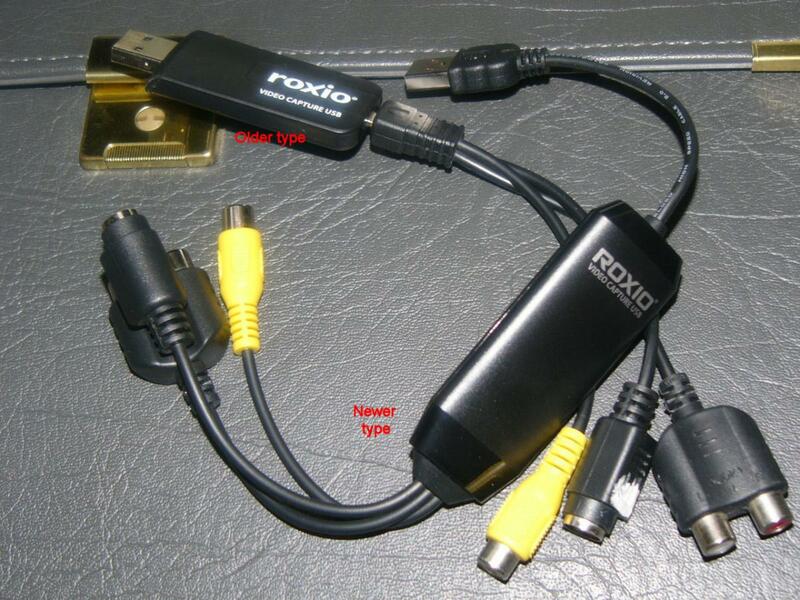 I found the Roxio USB device in the sounds games area of the device manager and deleted it then removed and restarted. my problem now is the disc starts setup tells me I have a newer ver already installed and goes nonresponsive. I even tried to uninstall the program to no avail. that was when I considered looking for a restore point prior to the updates when things were working. but I don't set them and I don't think they are programmed occur regularly. I was referring to the Easy VHS to DVD software disc and NOT the Creator 2010. 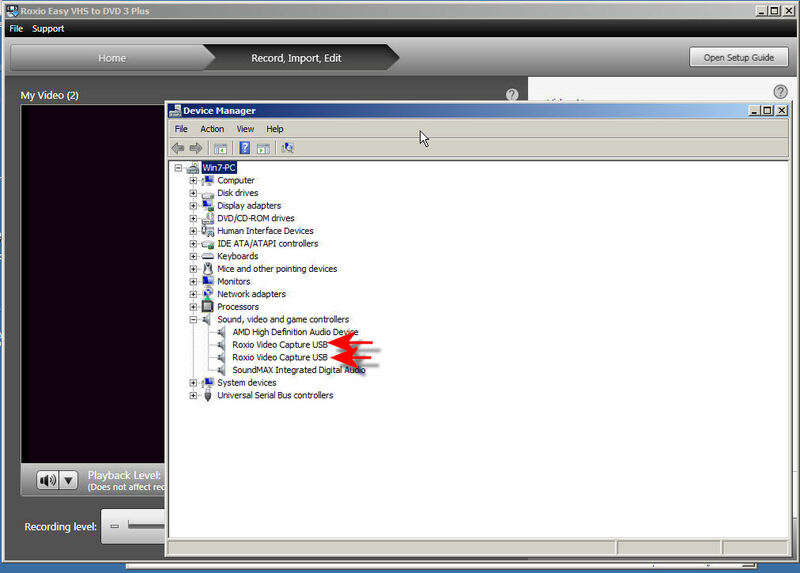 Try copying all the files on the EVD disc to a new folder on your PC. Then run the install (setup.exe) from there. then next screen was key # entered gave me not valid, re-entered (was correct) and could not validate. stuck there . creator 10 special (worked best for me, never got nxt to work right and forum recommended staying with creator 10) and evd for driver I have dell software service and they do a pretty good job when I've had trouble in past. Click on the red Roxio at the upper left corner of the screen. Then look for My Account on the right. Click My Account and enter the email & password you use here. To your question, no, EVD conflicts with nothing. It has always been a pretty trouble free install. yeh, its the same number I have on the disc sleeve it came in. never had soooo much trouble with a re-install or repair. I cant even uninstall it. Now insert your EVD Roxio Disc.